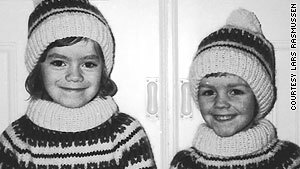 Brothers Jens, left, and Lars Rasmussen grew up to become some of the world's best Web developers. (CNN) -- Lars and Jens Rasmussen were broke and jobless -- with only $16 between them -- when they made it big in the Web world by selling their idea for Google Maps. Years later, after finding cushy employment at Google Inc., the Rasmussen brothers flew in May from Sydney, Australia, to California where they would debut their sophomore product, a Web application called Google Wave, which they say, quite audaciously, will kill e-mail and forever change online communication. But their lives didn't depend on its success -- not like before. Strange as it may seem, that worried them. With Google Wave, the Danish brothers are trying to recreate the kind of near-ruin stress they experienced when they came up with the product that made them wildly successful. In doing so, they're trying to prove that innovation, a somewhat magical and ethereal happening, can be engineered just like software. But, as they prepared to take the stage to unveil Google Wave at a Web developers' conference in San Francisco, their faith in that hypothesis started to slip. Was Wave too ambitious? Would the glitches come back? Was it too soon? Were they under enough pressure? And, worst of all: Would they become one-hit wonders? The night before Wave's big debut at the Google I/O conference in San Francisco, Lars Rasmussen laid in bed from 2:30 to 5 a.m.
His wife, Yarima, caught him practicing his pitch for Wave during the fretful slumber. He waved his hands in the air as if he were pointing at a projection screen. She knew he hadn't been sleeping in months as he prepared Wave for this presentation. The next morning at the conference, Lars stood offstage, trying to calm his nerves by listening to Eminem on an iPod while a co-worker gave him a glowing introduction. "The engineering leadership behind what you're about to see is the work of two brothers and an amazing engineering team with them," said Vic Gundotra, a Google vice president of engineering. He spoke in a coolly excited tone, like that of a school guidance counselor. "Those two brothers are Lars and Jens Rasmussen. You might remember those names because those were the same amazing people that did another magical app, called maps ... Google Maps." The stage at the conference had a game-show feel to it: A big logo -- all vertical stripes, just like "The Price is Right" -- served as a backdrop to two Jeopardy-looking podiums in the center of the stage. Lars looked like he'd just gotten off a shift at the Gap. A microphone headset was stuck to his ear and he wore jeans and an untucked blue T-shirt with the Google Wave logo on it. He fidgeted with a water bottle, opened his laptop and nervously began the biggest pitch of his life. Lars has always been the pitchman. Jens is the quiet older brother: the eccentric, the idea guy. When he's onto a big idea, Jens almost never writes it down. Words confine good thoughts and kill them, he says. He mulled over his idea for Google Maps for years before putting it into a written proposal. But with Wave, he didn't have that luxury. When the brothers joined Google together after selling Jens' idea for Google Maps, they already knew he had to come up with something new -- something bigger. So Jens set to work. He shuttered himself in his Copenhagen, Denmark, apartment, tuned his television to MTV, watched some music videos and let his thoughts drift. By the end of a weekend, he had come up with Google Wave, his idea for an e-mail killer. We asked ourselves the question: What would e-mail look like if it was invented today? He sent the idea to Lars in an e-mail. "I remember being immediately sold," Lars said. "He'll claim it took a couple of days, but that's entirely untrue." In theory, the idea for Wave is simple. It's e-mail updated for the Internet age, Jens says. E-mail as we know it is based on the snail-mail format: you send a message; your friend receives it. Wave makes mail collaborative and instant. When you type a message to a friend, he or she sees what you're typing as you type it. You can jump in and start drafting a reply before the initial message is complete. Wave also lets users collaborate on editable documents, called Wikis, share photos, update blogs, set appointments and chat in big groups. You can add conference calls to a Wave. A translation function called Rosy will translate chat messages between languages as you write. Jens hopes the product's name will replace "e-mail" in English vernacular. So, after Wave's public release later this year, you might say to a friend, "Let's start a Wave" instead of "I'll send you an e-mail." Wave is free and runs through the Internet, meaning that, like Gmail, you don't have to download a program to use it. This also makes Wave highly ambitious from a technical perspective. Lars and Jens are almost performing magic tricks with Internet browsers. Asking a developer to create a stellar piece of software that runs through the Web is somewhat like asking a composer to write a symphony on a smartphone. The Rasmussens admit their product is confusing to explain and is trying to make a massive leap forward into uncharted technological territory. For these reasons, Jens, the idea guy, considered proceeding more slowly with Wave's release. Maybe he and Lars should wait another year, or put off some of its more complicated features, he suggested. But Lars is the risk-taker. And Jens folded to his vision. On stage at the conference in San Francisco, Lars started his spiel. "When we started this project more than two years ago, we asked ourselves the question: What would e-mail look like if it was invented today? "And obviously there are about a million ways you can try to answer that question. What you're going to see today, Google Wave, is our attempt." Lars struggled to explain Google Wave to the audience. He pulled out all kinds of comparisons to try to get the message across: Wave is like mobile texting, it's like a Wiki, it's like instant messaging, it's like a blog. It's like e-mail -- well, kind of. It's something new, he said. At first, it was difficult to tell if the audience was buying it. Some demos of Wave's features rolled by with scant reaction from the crowd. "Don't be shy, you guys," Lars said. "If you like something, don't be shy in letting us know. We can handle any amount of applause." Soon things started to pick up. When Lars typed a Wave message to Wave's group product manager, Stephanie Hannon, it showed up on both screens of their computer monitors simultaneously, character by character. When they both started typing at the same time, the streams of moving text looked like furious ants crawling around on the screen. The audience cheered in excitement. Twelve minutes into the presentation, Jens made his entrance, if you could call it an entrance. He looked about as comfortable as a spokesman for a hemorrhoid cream. His job was to demonstrate the way that Wave will play back the history of a message if someone enters a conversation late. The audience loved it. It seemed like they were going to be sold on these new ideas. But it was still early. "So, now that I'm caught up on this Wave, I'm just going to add my reply," Jens said.
" 'Me ... too,' " Jens said, speaking the words he was typing into a message. When the dotcom bubble burst in the early 2000s, the Rasmussen brothers were laid off within weeks of each other, both from a company called Digital Fountain. There were virtually no jobs to look for in technology. So the brothers cashed in one of their pensions, sapped bank accounts and put their lives on the line to chase a kooky idea Jens had about map-making on the Internet. Without the risk and the pressure, they wouldn't have been able to do it, the brothers said. "I do believe that you can achieve more if you're willing to take risks," Lars said in a recent phone interview. "There's almost a total correlation between the amount of risk you're willing to take and then the amount of stuff you then potentially can get done." The Rasmussen brothers have done their best to recreate the high-stakes situation that produced Google Maps. They wanted to make a stress incubator, to start a fire under their team that would propel its creativity to new heights. • Google Wave would operate as a start-up company within the corporate giant of Google. • The 60-person Wave team would be based in Sydney, Australia, far away from Google's corporate headquarters in Mountain View, California. • Google employees who wanted to work on Wave would have to take a risk to join the brothers, a diluted version of what the Rasmussens faced when they started Google Maps. The team took cuts to their bonus pay, with the hopes of a big payout if Wave were to succeed. • And their project would be secret. The rest of Google's project files, codes and other documents are accessible to anyone in the company. Not Wave's. The Rasmussens felt good about their recipe for success through risk-taking. But it also made them more nervous. Along the way, they found another form of motivation: the fear of failure. "Did you notice how quickly it reloads?" Jens said with a laugh, trying to recover from the crash in the middle of his presentation. Throughout the rest of the Rasmussen brothers' pitch for Wave, Jens and Lars pulled out a number of pre-planned jokes to deflect attention from the shortcomings and crashes of their fledgling product. Lars started dancing and humming elevator music to make up for one lull in the demo, much to the horror of Yarima, his Cuban wife, who says Lars is an adroit Latin dancer. "Inside my Wave I'm going to write 'check this out' and then I'm going to copy the link in there, and then ... I'm going to dance a little while the system spectacularly fails," Lars said, trailing off as Wave crashed again. The brothers continued in this awkward way for what seemed like an eternity. But when the presentation ended, the audience had loved it. When Lars demonstrated Wave's ability to translate between languages, in real-time, as a person types, the audience cheered so loudly and for so long that it felt like they were calling for an encore at a music festival. At the conclusion of the show, Jens remembers the developers giving them a standing ovation, shaking their laptops above their heads. Lars and Jens were elated. But the May demo was only a dress rehearsal, one held in front of a friendly audience that understands Wave's technical ambitions. The real show will come when Wave is released to the public, when Google's army of users decides if it wants to take this leap beyond e-mail with the Rasmussen brothers. Or if they're up for that risk.